Whats your favorite Disney Park Ride & why? Discussion in 'Off Topic' started by Dark Jedi, May 29, 2011. Beings I went a month ago and never really seen a thread like this made. SO I figured what the hey. As the title said whats your favorite and why. It can be from Disneyland, Disney world, or any of the parks around the world. I will start by saying my all time favorite ride is the Haunted Mansion (WDW) Its a ride that has stood the test of time and still has a long line to get in. I first rode this ride in 1980 when I was 9 years old and now at 39 it still fascinates me on how simple the effects are and still has that scariness effect as well as its humorous side at the same time . I took my son on it this past month and it scared him bad the first time but he is 7 years old. THen riding it over and over he came to love it as I do. Its a ride that I hope they never get rid of and I doubt they ever will. Its a ride that defines the parks. Everyone that been to one of the parks talks about that ride. I just wish I lived closer and could enjoy it more. My one wish is when I die that my ashes are placed on the ride so I can feel I am finally home. I wonder if they would do that . 2 rides that I miss is the 20,000 leagues under the sea and Mr Toads wild ride. So lets hear your rides you love to death. My favorite ride at Disneyland: Space Mountain. It's my favorite rollercoaster and I've been on many different rollercoasters simply because of the fantastic atmosphere and because it feels like you're traveling around in space and plays great accompanying music. It's also nice and cool for those hot summer months. I don't think there's any rollercoaster like it elsewhere. I also really love Indiana Jones again because of the thrill level, great atmosphere, and fun adventure. I basically love that Disney rides are all themed and have great atmospheres, including Haunted Mansion. I can't choose one definitively so I'll pick two. At Disneyland, I love Space Mountain. It's unlike any other roller coaster I've been on being that it's indoors. The second one is California Screamin' at Disney's California Adventure. Crazy fun and I love the music that accompanies it. Just got back from WDW Florida for our 5th trip. Absolutely love the place I'd move to Florida tomorrow. I love different rides at different parks but mainly I love Space Mountain at Magic Kingdom and Aerosmith at Hollywood Studios. Love Space Mountain, California Screamin' and MaliBoomer. Really, all the rides are pretty great I think. Although I think the Matterhorn Boblseds could use a little update. Fer cryin' out loud, you can unbuckle the safety belts during the ride, and the seating is uncomfortable! Leave the ride alone and just update the bobsleds, and it would be so much better. Oh, and Disneyland in California still has Mr. Toad's Wild Ride. I still do that and Peter Pan when I go, even though I'm in my late 30's, becauseI remember riding them when I was a kid. Its not MGM no more. Its Hollywood studios now. You mean this AT AT? Is that at Florida, always assumed that was California when I saw the you tube videos. And YES that's it! Was 7 years ago at least. Loved the scenery there, lol. And the Stunt Show - I'm not a car fanatic or anything but yes the Lights, Motors, Action show is fantasic, to be honest ALL of the shows there are so worth seeing. I wasnt sure if it had always been Hollywood Studios each time I had been, but I've just googled it and it says Jan 2008, but not read the full article. Yeah its florida. 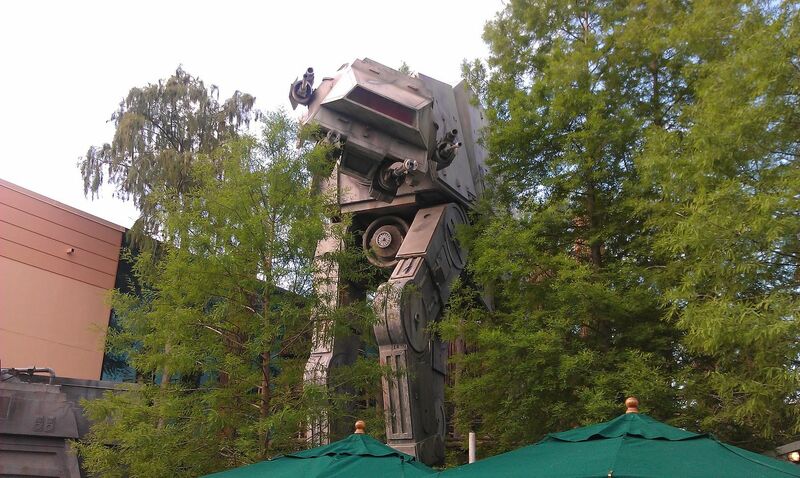 they also have a speederbike across from the star tours building. My son really enjoyed the stunt car show. Its nice they are getting more live action shows. I really want to go to Disneyland one time to compare the two. I like the buzz lightyear space ranger spin ride and made my wife mad as I got 999,999 score. The one at disneyland looks much better. I remember what the bus driver told us on the way back to the airport. How many needs a vacation from your vacation. It is tiring doing disney and you need another vacation just to recover lol. yup, we decided this year to just do a carribean cruise or a trip to hawaii. as fun as last years was, disney, universal (both parks), seaworld , and also house shopping. we were excited to get back to work so we could "relax"
Been to wdw about 17 Times with the family. Annual pass holders three times. Favorite ride? Mission space and soarin, in that order. Disneyland can get so busy during the peak times of the year that they have to refuse admission after a certain time. I saw the prices for Disneyworld a while back and nearly freaked out. It's like $90 for an adult for a day. I haven't been to a theme park (any theme park) in close to 20 years now. I have fond memories of visiting both DW and DL. That may be because they just seemed more magical as a kid. where as 6 flags we just bought season passes for 45$ a person and theyre good for any 6 flags in the world. I need to go back then. I'm a little kid again when it comes to ANYTHING star wars. Had to quote this pic cause its just SO FREAKIN AWESOME!! !